Blizzard warnings have been issued for the Rockies and Plains areas, where a second bomb cyclone is predicted. Here, a man uses a bulldozer to clear snow in Limon, Colo., that was left by a bomb cyclone that swept across much of the state last month. "Warm today. Snow tomorrow," says the NWS office in Denver and Boulder, Colo., predicting temperatures that could hit record highs Tuesday — followed by rain turning to snow, in a blast of cold air that will ride winds of 40-60 mph on Wednesday. For many central U.S. residents, the week began with warnings of a possible winter storm. But predictions now call for an April blizzard that could bring whiteout conditions. And because of the intense drop in pressure, the system could develop into the region's second bomb cyclone in less than a month. Lots of #bombcyclone talk out there again this week. In addition to snow, residents could see dangerous flooding, including in towns in Nebraska, Iowa, Minnesota and along the Missouri River, where people are still coping with the effects of last month's floods. "Heavy snow will develop in the mountains Wednesday morning and then may spread across the plains Wednesday afternoon," the NWS office in Boulder says. The agency's blizzard warning for northeast Colorado applies from noon Wednesday to noon Thursday. Blizzard warnings have now been issued in several states, from the Dakotas and Colorado to parts of Iowa, Nebraska and Minnesota. The storm came ashore from the Pacific Ocean on Sunday and Monday, bringing heavy rainfall and floods to Oregon, where evacuation orders were issued in the Eugene area, Oregon Public Broadcasting reported on Monday. It is also expected to cause problems in Idaho and Montana as it gets closer to its expected meeting with cold air. "Snow is expected to develop Wednesday morning over the higher terrain and spread eastward," the National Weather Service office in Colorado says. "Precipitation is expected to begin as rain but change to snow during the day as colder air moves into the area." As for how much snowfall might accumulate, forecasters say that's still uncertain for some areas — but that overall, the snow totals could be similar to last month's blizzard. Parts of South Dakota could see more than 24 inches of heavy, wet snow, the NWS office in Sioux Falls says. Other areas in the state and neighboring areas might see only a few inches. The sudden about-face is similar to the way the inland bomb cyclone formed in March, when the weather in the Rockies and Great Plains shifted from clear skies and temperatures in the 50s and 60s to rain, snow and howling winds. It's not unusual for these parts of the U.S. to experience swings from warm temperatures to snow in the springtime. But the intensity of the coming switch has caught forecasters' attention — and they're warning people to keep a cautious eye on conditions that could quickly turn dangerous. 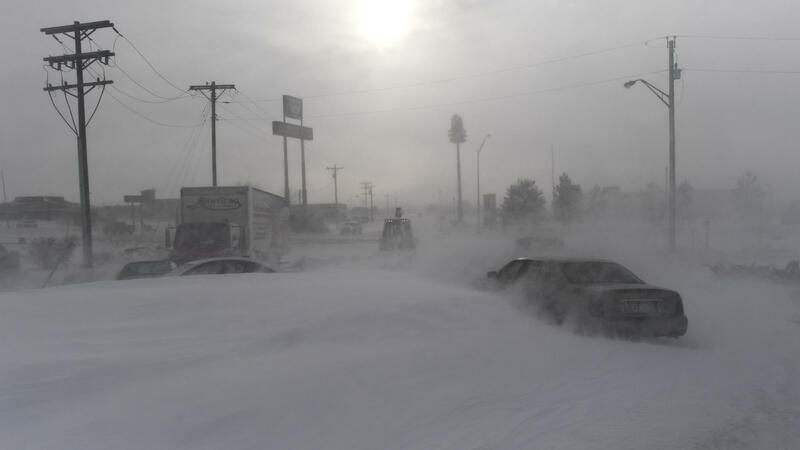 "We usually get a winter storm sometime in April," the National Weather Service's Kari Fleegel told South Dakota Public Broadcasting 's Gary Ellenbolt. "However, amounts that we have forecast right now are pretty rare. Some of this might be record territory." The NWS office in Aberdeen, S.D., where Fleegel is based, is urging people to change their travel plans to account for a storm that it now expects to bring snow in two waves, from 3 a.m. to 6 p.m. Wednesday and from 3 a.m. Thursday to 6 a.m. Friday. The result, the office says, adds up to a "potentially historic spring blizzard." Announcing a blizzard warning for west central Minnesota Tuesday, the Twin Cities NWS office asked residents, "Have you taken your winter safety items out of your car for the season? Time to put them back in your vehicle." "The meteorological term 'bomb cyclone' refers to a storm that intensifies very quickly through a process called bombogenesis, in which barometric pressure falls by at least 24 millibars over 24 hours. That's what happened in parts of the central U.S., where just one day before blizzard conditions hit, many areas such as Denver were enjoying sunny weather in the 50s and 60s."